Pre-heat the oven to 200ºC/400°F/gas 6. Grease the inside of the ramekins with half of the softened butter and sprinkle with the breadcrumbs so that they stick to the butter, shaking off any excess. Bring the milk to the boil and place the haddock into it, then remove from the heat, cover the pan in tinfoil and leave to cool. Remove the haddock and flake it, making sure there are no bones, and reserve for later. Measure 300 ml (10½ fl oz) of the milk from the haddock poaching liquor into a jug. In a small pan, boil the double cream and add the horseradish. Keep warm. In a separate pan, melt the remaining unsalted butter on a low heat, add the flour and cook for a couple of minutes, then slowly add the reserved milk a little at a time, beating so that you don’t get any lumps. When all the milk is incorporated keep stirring until the mixture thickens, then season with a little salt and pepper, remove from the pan into a suitably sized bowl, cover with clingfilm and cool slightly. When you are ready to cook the soufflé, whisk the egg yolks into the white-sauce mixture. 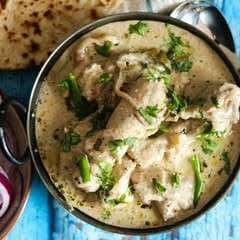 In a clean bowl, whisk the egg whites and cornflour to soft peaks, add a third of this to the white sauce to loosen the mixture, then add the remainder of the egg whites and fold in carefully. 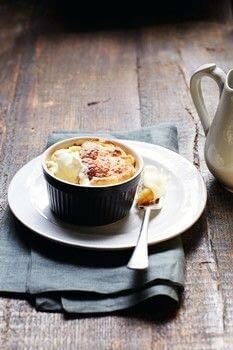 Put a spoon of the mixture into each of the prepared ramekins, then divide the smoked haddock between them, spooning on the remaining soufflé mix to the top of each ramekin. Wipe the edges of the ramekins and run a blunt knife around the top of the soufflé mix – this will help them rise. Place in the pre-heated oven and cook for 10 minutes or until golden and risen above the mould. Serve immediately, pouring a little of the horseradish cream into the top of each soufflé.